It’s been almost two months since my family trip to Orlando and the Walt Disney Resort. During that trip I had a pretty extensive list of coin machines I needed to visit. Some I needed to actually press the coins and others I just needed a picture of the machine for my website and personal collection records. I was able to get every machine except for one. I visited the location for this machine on our very first day in Orlando. Since the first day was our travel day we didn’t want to waste a partial day at one of the theme parks so instead we headed to Downtown Disney to walk around, and do some shopping. There were a couple other machines in Downtown Disney I needed to visit but the first one I went to was in the West Side at the Cirque Du Soleil gift shop. I entered the store with my daughter and niece and while they checked out the unusual gifts available in the store I did my usually casual wander around the perimeter of the store trying to locate the machine. But to my disappointment I didn’t see it. So I walked outside to glance around to see if it was around a corner, or near the payphone, but still nothing. I went back inside and decided to ask the staff member at the register about it and was told the disappointing news that the machine had been removed for repairs. Every so often I come across this situation and some places actually keep extras of the coins behind the counter to sell while the machine is out getting fixed, unfortunately this store didn’t do that so I was out of luck. This was not the best way to start off my vacation of coin collecting but things definitely got better and as I mentioned earlier this ended up being the only machine I wasn’t able to acquire. I had reached out to some contacts and friends of mine to try to see if anyone had extras of these designs, or if they had any news on the machine. It seemed like weeks went by and I hadn’t heard anything other than the machine was still missing from the store. Then finally just last week a seller on eBay that I have used quite often in the past had some new items up for auction and to my surprise it was these mysterious Cirque Du Soleil designs. I quickly did what I had to do to get all four designs and a few days later they arrive in my mail. I have not see the Cirque Du Soleil show La Nouba in Downtown Disney but have heard that it is really good. To be honest I haven’t seen any Cirque Du Soleil shows and I’m in Jersey where they come to New York all the time. My family has seen a show or two and always rave about it so I guess I’ll have to check one out at some point to see what all the fuss is about. The four designs were all inspired by the La Nouba show. I had to look up these descriptions at presscoins.com as I really had no idea what a couple of them were so much thanks to them for their amazing database and blog. The designs are: BMX Cyclist, Green Bird, Titan and two other performers, and Les Cons (The Nuts). All four designs also say La Nouba Cirque Du Soleil. 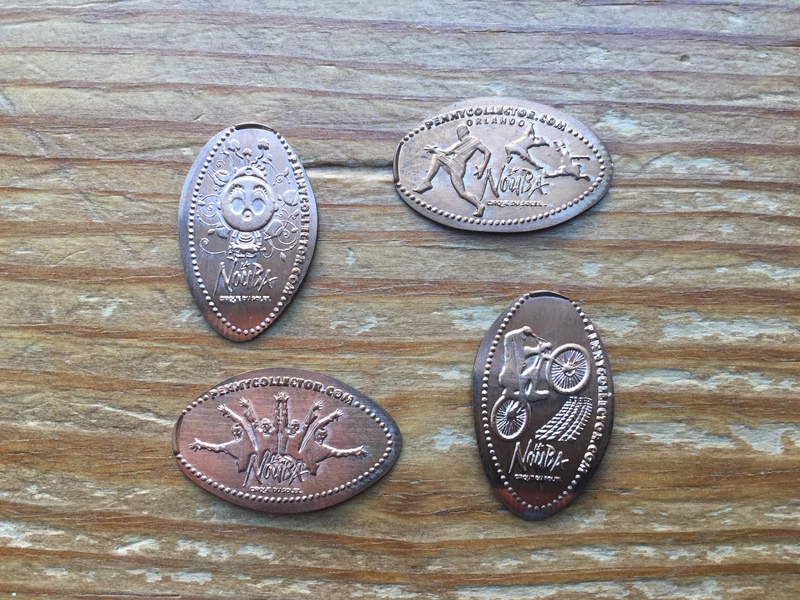 There is a nice feeling right now of completion knowing that I have all the current pressed coin designs available at the Walt Disney World Resorts, but I know that is short-lived (Thankfully) and I’ll be on the hunt again very soon.